1891 serious riots occurred along the Yangtze River, churches were demolished, missionary residences wrecked and looted, and missionaries themselves were obliged to abandon their stations and to seek refuge in Shanghai. Among other happenings, an attempt was made by an Englishman named Mason to start a rebellion. He was a fourth class assistant in the Maritime Customs at Chinkiang. He undertook to procure arms and ammunition for the rebels, and to smuggle them into Chinkiang for the purpose of starting a revolt against the Manchus. Proceeding to Hongkong, he secured 35 cases of arms and ammunition and shipped them in piano cases as freight on board the SS "Chi-yuan." He and his associates took passage on the same ship, intending to start a mutiny, gain control of the vessel, and proceed directly up the Yangtze to Chinkiang, without calling at Shanghai. At the last moment his nerve failed, and instead of assisting in the mutiny, he helped to suppress it. On arrival at Chinkiang, his share in the plot having been discovered, he was arrested and sent to Shanghai. At his trial he pleaded guilty and was given nine months' sentence. While in gaol he tried to escape, but was recaptured and finally deported. 1892 William Farrell Martinson was born in Chinkiang, China; his sisters Constance, Jeannette, Mary and Anna were also born there. According to the birth certs, the parents were William Frederick Martinson and Elizabeth Martinson née Maddock (the couple married in Newchwang, China - a treaty port from 1858, where today's Yingkou is located.). Chinkiang was not exactly a peaceful place to live at that time. His father was a tidewaiter with the Chinese Customs. A "tidewaiter" being a custom house officer who watches the landing of goods from merchant vessels, in order to secure payment of duties. They appear to have been living at Chinkiang. One gets the flavour of the place from this extract of an ex-pat there in 1905 "Mr. Rasmussen was barely twenty when he joined the Chinese Customs Service at Chinkiang, where there was a small, lonely British concession. During his first four years, two of the original thirty-five Europeans died, two went mad, two cut their throats, and he himself was twice nearly murdered by smugglers. The death cert is for Woldemar Frederick Martinson, occupation Secretary to the Chinkiang Municipal Council. The informant was a P J Wilson - not obviously a relative. Date of death 20.12.1917, age given as 69; the marriage cert gives his age as 39 in 1889, which doesn't quite match, but if the informant of his death wasn't a relative. William Farrell's father was said to have been born in Russia - and there are Martinsons in Ireland who originated from Russia in the 1901 and 1911 censuses (including even a Woldemar Martinson!!). 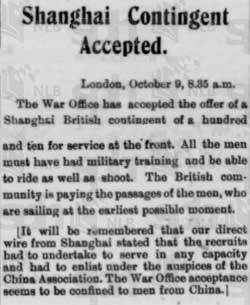 The Shanghai contingent did not waste any time on the journey, for they all underwent military training on board ship right through the voyage. 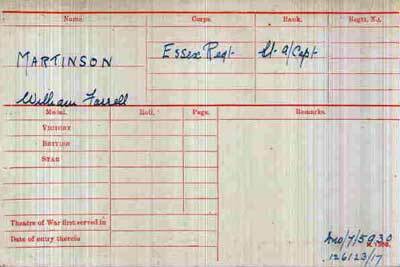 The journey occupied ten weeks and was of an adventurous character, the Emden being at large when they set off. 1914 Dec 15. 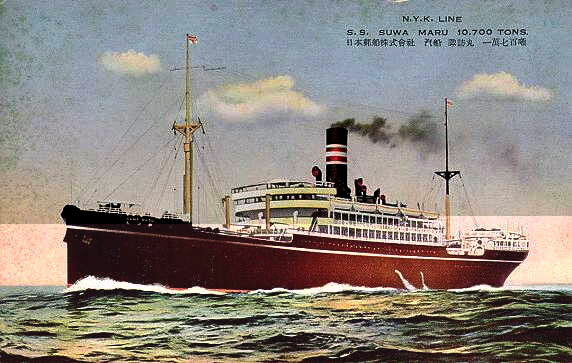 Arrives in London on SS Suwa Maru from Shanghai, part of a group of young men who comprised the "Shanghai contingent " in the manifest. There is a book about them. They appear to be recruits for the British Army, and they marched as a column to the Central Recruiting Office in London when they arrived, and most of them joined one of two regiments: the 10th Battalion of the Yorkshire Regiment, or King Edwards Horse. 1915 Apr 22. Arrives in France with King Edward Horse. The regiment was strictly a unit of the Special Reserve. It was mobilised on declaration of war and temporarily attached to 4th Cavalry Brigade. In April 1915, the regiment was split up. C Squadron, together with HQ, moved to France on 22 April 1915 and joined 47th (London) Division, but moved to join IV Corps in June 1916. 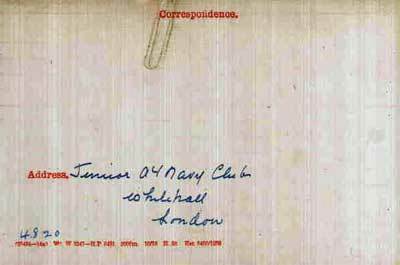 Information from King Edward's Horse show William F. Martinson 860 England Cpl France 22 April 1915. C Squadron. 1916 May 26. He was wounded at Vimy Ridge ). Heavy shelling on our front by minenwerfer. Our artillery replied effectively as the minenwerfer were not heard again for a considerable time. 1917 Dec 5. Essex R. Temp. Lt. W. F. Martinson to be actg. Capt. while comdg. a Co.
1918 Mar 23 Becomes a German prisoner of war. After recuperating from a shell wound (in both upper legs - just below the groin) he was held in Stralsund POW camp for allied officers on the Baltic coast. He managed to escape but was arrested. Returned to Stalsund and after release shortly after 11 November 1918 was co-opted to assist with the repatriation of prisoners / soldiers from Copenghagen to Britain. 1918 Apr 12. Press report of him "wounded and missing"
1918 Dec 9. He was with a group that left Stralsund POW Camp (see list on this website) and went to the rest camp at Hald, Jutland, where he appears to have been on the repatriation staff. Between 11 November 1918 and mid January 1919 almost a quarter of the British Prisoners of War ) held in Germany were returned to Britain via Denmark and the Baltic ports. The operation became known as the ‘Danish Scheme’. 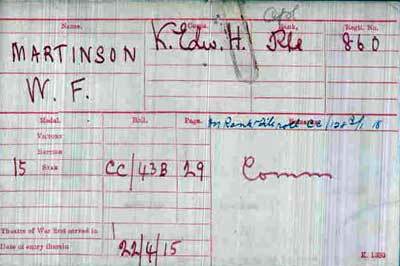 1919 Jan 19 Repatriated from POW camp back to UK. With a repatriation date of 19th January it looks like he was on the hospital-ship Formosa which left Copenhagen for Leith on 17th January. 1920 Sep 1. Promoted Section Leader. 1921 Feb 7. Moved to a permanent position in RIC but remained with ADRIC and appointed the Commandant ADRIC Depot Coy, Beggars Bush, Dublin. 1921 Oct 22. The Irish Times reports. Since the truce came into operation the Auxiliary Division of the Royal Irish Constabulary have organised many entertainments in Dublin, but perhaps the most successful was a dance which was held last night in La Scala Theatre. It was organised by the Officer Commanding R Company (Captain H. Bannerman) and other officers. The spacious and handsome ballroom was taxed to its utmost, about 120 couples being present. Among the guests were General A.E. Wood, C.B., C.M.G., D.S.O. ; Captain W.F. 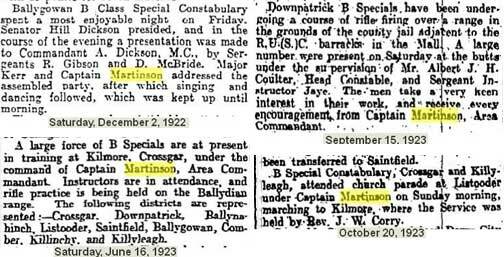 Martinson, and representatives of the garrison units in Dublin, together with a large number of local residents. The music was supplied by Mr. A. P. Rafter's orchestra. 1921 Dec 29. Kings Police Medal gazetted. 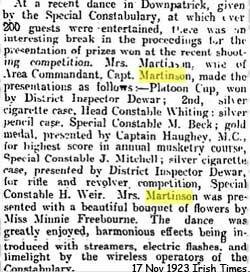 William F. Martinson, District Inspector, Royal Irish Constabulary. “ DI Martinson has served as Adjutant of the Auxiliary Division RIC for the past 8 months and has shown untiring energy and devotion to duty”. According to Irish Police records he joined the Palestine Police as Adjutant to the headquarters staff of the Palestine Police. 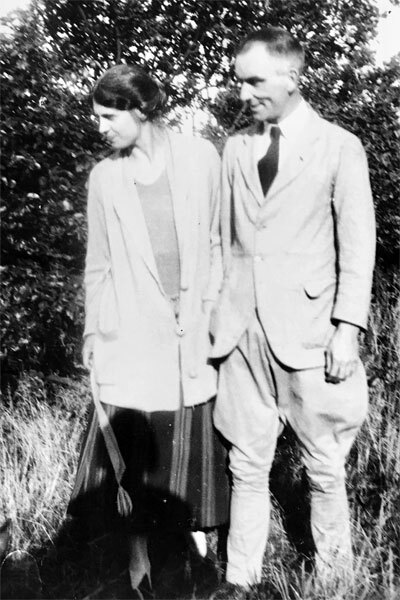 1922 Sep 22. married in East Sussex to Mildred Esther Parker. His residence at the time was Downpatrick, Co. Down, and his occupation is given as DI Ulster Constabulary. Mildred and her immediate circle of friends were adherents of the Christian Science religion. Following the marriage, Martinson also became an adherent of this faith. As far as is known all four children of the marriage were born in Northern Ireland. So the stay in Palestine was only short. When the Royal Ulster Constabulary was formed in Northern Ireland on 1 June 1922 there is a list of 51 officers transferred from the old RIC, and Martinson is not on that list, so he did not transfer at that date. 1923 May 4. Birth of first child, William Patrick Martinson (Bill). Birth certificate records place of birth as Downpatrick, Northern Ireland. William Farrell Martinson's occupation was listed as Constabulary Officer. 1926 July 5. Birth of second child, Michael John Martinson. Birth certificate records place of birth as 36 Lancefield Rd, Belfast, Northern Ireland. William Farrell Martinson's occupation was listed as Multiple Grocer. He had apparently opened a few grocery stores, but the venture was not a commercial success. 1928 Feb 15. 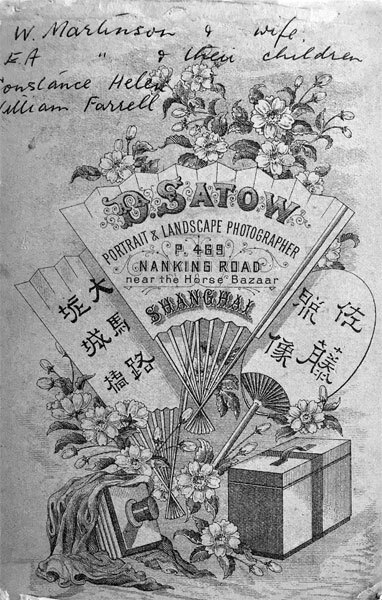 His mother Elizabeth Martinson (then aged 70) returns to Shanghai from UK. She gives her UK address as 15 Havilland St, Guernsey. Her daughter Constance's husband Urban Kelly originated from there. Urban and Constance met and married in China. Urban Kelly was Superintendent of Police in Chinkiang and Secretary of the Chinkiang Municipal Council in 1912 when he married. 1928 August 16. Birth of third child, David Martinson. Birth certificate records place of birth as 36 Lancefield Rd, Belfast, Northern Ireland. William Farrell Martinson's occupation was listed as Merchant. 1930 November 8. Birth of fourth child, Elizabeth Anne Martinson (Betty-Anne). Birth certificate records place of birth as Castle Lodge, Kilgobbin, Rathdown district, County of Dublin. William Farrell Martinson's occupation was then listed as Manufacturing Representative - apparently Fire Extinguishers, Fire Escapes and similar equipment etc. 1931 - 1937. The Martinson family lived in Luska, a three-bay single-storey house, built circa. 1875, near Nenagh in County Tipperary. Sited in an isolated position at the end of a country road on the shores of Lough Dergh and originally designed as a hunting lodge, it had an attic storey, a porch to the central bay and facetted bay windows to the gable-fronted end bays and to the side elevations. 1937 May. Irish Independent shows that he was playing tennis in the Hard Court Championships at Elm Park. 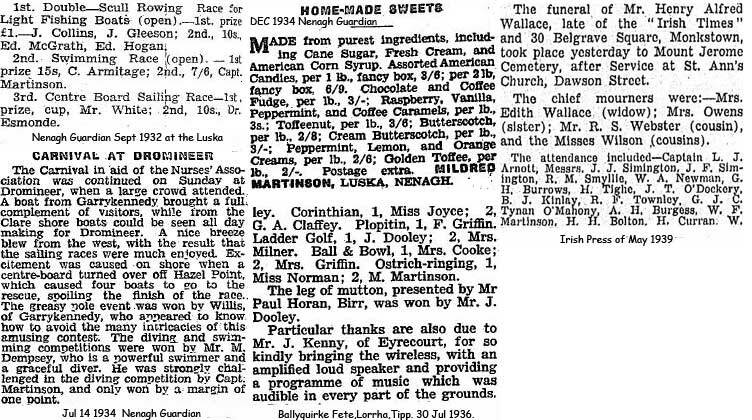 He appears a number of times from 1937 to 1939 in Dublin and Kildare area tennis reports. 1937 May 12. Coronation of King George VI and Princess Elizabeth. The two elder Martinson boys were at boarding school in Edinburgh during the Coronation and Union Jacks were hung in profusion in the town. They returned home a few days later on the cattle boat from Glasgow to Dublin with a Union Jack in their luggage. The Union Jack was duly tied onto the roof of Luska house. Early one evening a group of about 20 masked and armed men (presumably IRA) arrived at the house, rang the bell and angrily ordered the flag to be removed. Mildred Martinson advised that there was no one at home who could climb up on the roof (William Farrel Martinson was then commuting between Nenagh and Dublin and only returned on weekends). One of the men duly climbed onto the roof, ripped the flag off its mounting and threw it down whereupon it was torn up and stamped on. This frightening episode was witnessed by Michael Martinson (11) whose bedroom was in the central bay adjacent to the front door. The men advised Mildred that no-one was to leave the house for 24 hours and the vehicle gate was wired up to reinforce this instruction. Following this episode, whenever there was a visitation to their house at night time, William Farrel Martinson would apparently take his sword off the wall and have it to hand before opening the door. 1938 With the increasing militarization of Germany and the pro-German sentiments of southern Ireland, the family decided to again relocate and moved to Skarvagh House (built circa 1717) near Scarva, County Down, Northern Ireland, renting the central portion of the large double storey house. It was notable for its fine stone entrance porch and the two projecting double storey wings forming a three-sided entrance court. The two side wings were locked up and vacant during the family's stay at the house. The Scarva "Sham Fight", commemorating the battle of the Boyne is held every year in close proximity to Scarvagh house. 1939 September 3. A small farming operation was run at Scarvagh house, including a few cows. The three boys were at home on school holiday and the radio in the cow-byre was playing and this is where they heard Chamberlain's declaration of War against Germany at 11:00. 1940 Jan 28. Capt. William Farrell MARTINSON (110607), late Essex R., to be Lt. 28th Jan. 1940. 1940 January. William Farrell Martinson joined up and went to France as a Lieutenant in the Intelligence Division. He inspected a major portion of Maginot Line during this time. He was however frustrated that instead of tracking German troop movements his main role was one of a letter censor. 1940 May. 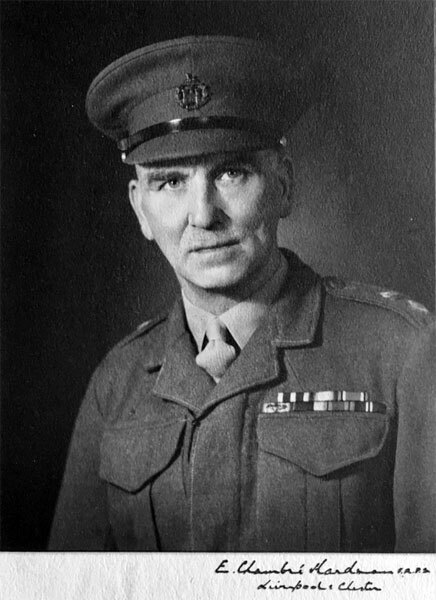 Once the German advance caused the British Forces to start retreating, William Farrell Martinson was directed to oversee the destruction of supplies and equipment that had to be left behind. 1940 June. Arriving at Dunkirk William Farrell Martinson was fortunate to find a birch bark canoe in an abandoned garage. With the help of two soldiers it was carried down to the beach and the three men paddled out to a trawler. He had with him a whole package of items he had collected, including German binoculars and various small arms. The two soldiers were not swimmers and when they stood up to clamber onto the trawler they caused the canoe to capsize. William Farrell Martinson was however a strong swimmer and managed to rescue both soldiers but his package of items was unfortunately lost. 1940 June. 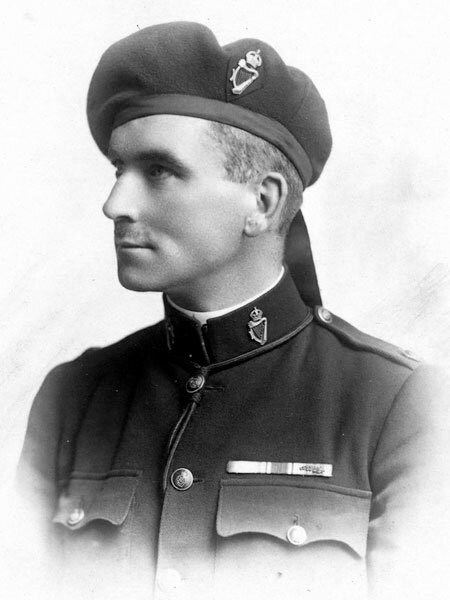 Following his successfully evacuation from Dunkirk, William Farrell Martinson immediately travelled to Windsor to visit his sons who were now boarders at the Imperial Service College. He arrived with his uniform in a disheveled state and with a tin helmet. Walking up Peascot Street accompanied by his sons, a group of young Grenadier Guardsmen passed and failed to salute Lieutenant Martinson. He stopped and tore a strip off the Guards - apparently much to the embarrassment of his sons. 1940 July. After the retreat from France, the division was progressively reformed on the north Wales coast - possibly at Rhyl or at Conwy. Lieutenant William Farrell Martinson was now posted to the Vulnerable Posts Wing (Blue caps) of the Royal Military Police of Western Command, where he was responsible for setting up guarding of sites such as Ammunition Dumps, Radio Stations and Shipyards. The family duly moved from Ireland and stayed for a short period in North Wales, staying at half a dozen different addresses. Following a brief time with a 'floating' HQ Lieutenant William Farrell Martinson was then provided with an office at the Western Command HQ in Chester. 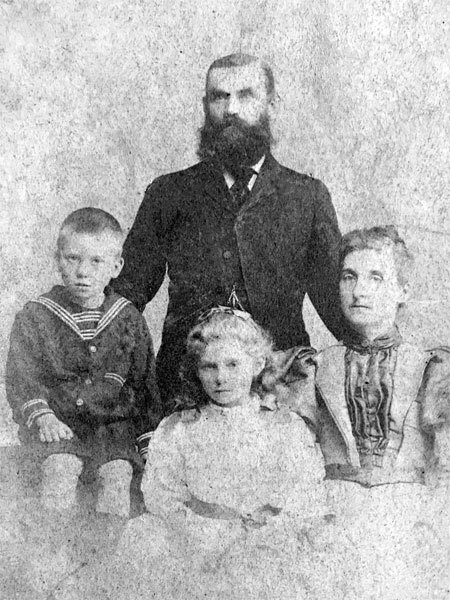 The Martinson family then moved to 39 Park Gate Street, Chester.